Children who practiced Nei Gong, an ancient Chinese movement/breathing practice, consistently for a month improved on a visual memory task and demonstrated increased functional connectivity between brain regions. This research joins numerous other studies that support Nei Gong and other mindfulness practices as tools to improve brain function in a variety of populations. 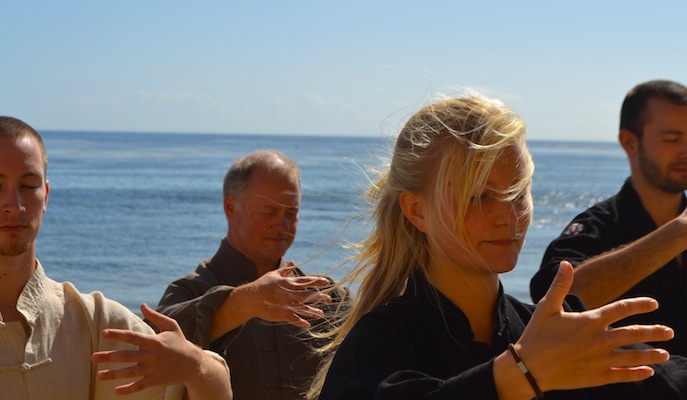 Nei Gong involves performing a series of smooth, gentle movements designed to produce relaxation and release muscular tension, and matching the movements with mindful breathing intended to promote a calm, attentive mindset. The practice of Nei Gong is part of the canon of mindfulness practices, and has commonalities with yoga and tai chi. While such practices are often associated with metaphysical theories (e.g. movement of energy and bodily fluids) that have a questionable scientific basis, studies of their practical effectiveness do not rely on the validity of these theories. Figure 1. 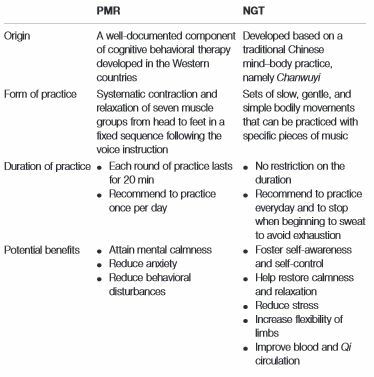 Nei Gong training (NGT) compared to Progressive Muscle Relaxation (PMR), from Chan et al 2015. In this study, three groups of children ages 5 to 17 received different training regimens: Nei Gong training (NGT), Progressive Meditation Relaxation (PMR) (Figure 1), and no training. The groups with training had two one-hour sessions per week. They were also encouraged to practice at home. Before and after the training, the participants completed a visual memory game, where they were shown a set of items, given a short break, then shown a second set of items and asked to identify the items that were also in the first set. The items fell into four categories: animals, food, tools, and clothing. The children went through the entire memory task twice: the first time the items were randomly arranged, and the second time they were organized by category (Figure 2). During the memory task, the children donned 19 electrodes on their heads that measured brain activity coherence, a proxy for connectivity between brain regions. The researchers also analyzed brain activity to collect evidence for which regions were more active during memory processing and observe any changes after training. The children who received NGT demonstrated greater total memory recall than participants in the PMR or no training groups in both the random and organized trials. They were also more likely to identify items sequentially based on their category (food, animals, etc.) in the random arrangement. In contrast, in the organized presentation of items, the children trained in Nei Gong shifted their strategy and were more likely to choose items sequentially based on their proximity to each other in the original set. This demonstrates a mental flexibility that can be challenging for some individuals with autism. Children with the lowest measured baseline intellectual functioning seemed to benefit the most from NGT. Figure 2. 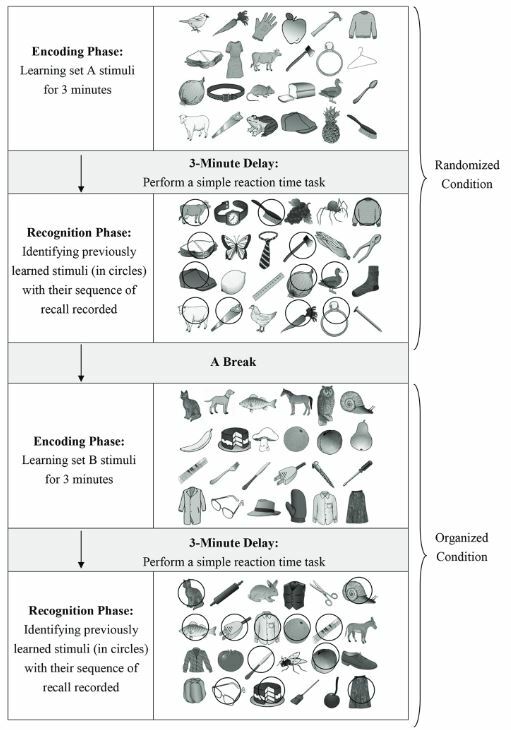 A schematic of the memory task, from Chan et al 2015. The NGT group also demonstrated improved brain coherence after training, especially in long-range connections between frontal and posterior regions. Eighty-five percent of the electrode pairs exhibited increased coherence, whereas only 15 percent of electrode pairs increased coherence in the PMR group, and none in the control group. 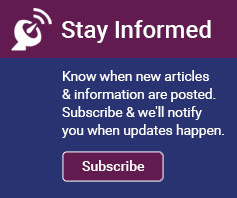 Differences in functional connectivity are emerging as a theme in the challenges associated with autism (TRANSLATE 10/14/15), so a simple, non-pharmacological intervention that demonstrates the ability to improve functional connectivity is an encouraging prospect. Several brain areas also showed greater total activity after NGT training. The prefrontal cortex on both sides, the left parietal cortex, and the medial and inferior temporal cortex showed greater activity in the random condition; the increase was even more evident in the organized condition. These brain areas are the same ones targeted by other emerging memory-enhancement techniques, such as transcranial magnetic stimulation and transcranial direct current stimulation. Some of the areas with enhanced activity are reportedly involved in categorizing processes, which makes sense alongside this study’s finding that the NGT group was more likely to use a categorizing strategy in the random condition. Previous work has also suggested that activation in these areas might indicate greater balance between activation and inhibition in the brain, a theme in autism that is gaining support in the literature, and was originally proposed by Dr. John P. Hussman (TRANSLATE 2/11/16). The PMR group also showed increased activity in the same brain areas, but not to as great an extent as the NGT group. The authors encouraged further research to see if Nei Gong improves other areas of cognitive function or enhances progress in other treatment programs. They also allow that their study included participants who were not as severely affected by autism, and suggest future work use this method with those individuals. Overall, this study adds to the evidence that it may be possible for individuals with autism to improve memory, enhance mental flexibility, and increase neural functional connectivity by employing a simple, no-cost method that can be practiced at home. That’s a possibility worth pursuing.